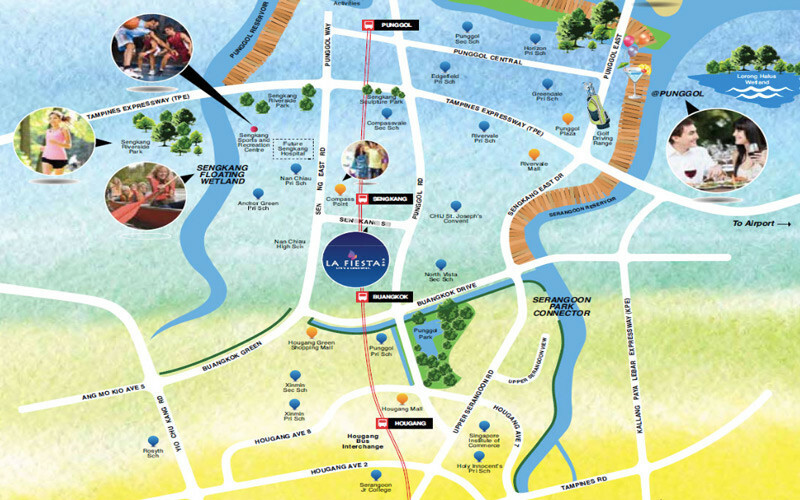 La Fiesta by EL development is located at SengKang Square and is just a minute leisure stroll to SengKang Central. This 99 year leasehold Singapore Condo is made up of 13 spectacular blocks that house up to 810 elegant suites with abundance of facilities such as mediterranean-style gardens, wonderland-inspired tea party tables and a dragon-themed playground. Dining,shopping and entertainment amenities are also available at the nearby Compass Point Shopping Centre. Slightly farther away, there are also the Rivervale Mall and Rivervale Plaza. The Compass Point Shopping Centre is one of the largest shopping the in the NorthEast Region and is integrated with MRT / LRT interchange along with the bus interchange. Meaning to say that the La Fiesta residents are merely a short walk away to public transport. With the interchange being just a stone’s throw away, travelling to all parts of Singapore is simply a breeze from La Fiesta. The Sengkang Riverside Park which runs along with the Punggol Reservoir running through it is just an LRT ride away. This tranquil and picturesque park which features beautiful greenery and trails is a great place for enjoyment and recreation. Singapore’s largest man-made wetland, the Sengkang Floating Island which is almost the size of half a football field can also be found here. Within 1 km from LA Fiesta, there are a number of good schools such as Nan Chiau Primary School, Nan Chiau High, CHIJ St Joseph’s Convent, Sengkang Primary and Secondary School.